While most residential homes have shingle rooftops, some folks have flat roof sections on their homes. 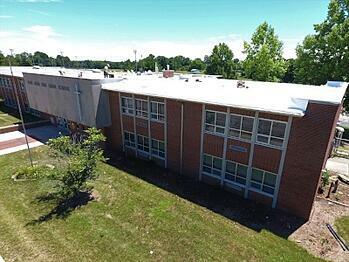 If you are an apartment owner, commercial building owner, school manager, etc., your property likely has a flat roof! 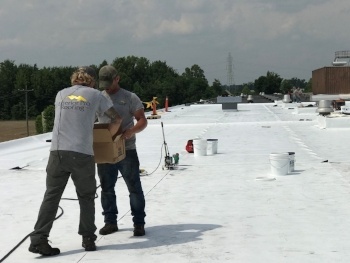 No matter the case, in this blog, we hope to provide some helpful insight into maintaining and protecting your property’s flat roof! Many suburban/urban homes live near forests or have many trees in their yards. While they may provide some pleasant shade during the summer, they pose a threat to your flat roof. Wind gusts can blow sticks and limbs onto your roof, possibly puncturing or scratching the membrane! Wildlife is also a factor of location. Whether you are near a forest or out in a field, squirrels, raccoons, and other creatures can be a nuisance to owners of flat roofs. While it is unlikely that they will puncture and rip through your roof, they will try to build their nests there. The feces can build up and will likely cause a unpleasant smell, and not to mention will cause staining if left long enough. With these things in mind, it is important to clear off your rooftop from time to time. While clearing, make it a point to look for cuts or punctures! Many people may own properties with flat roofs, however, not all flat roofs are the same! 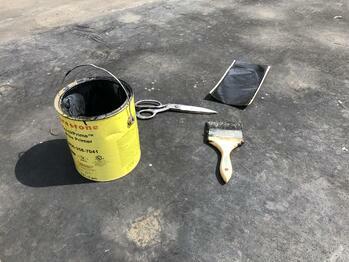 Two very common material used in flat roofs are rubber or PVC membrane. 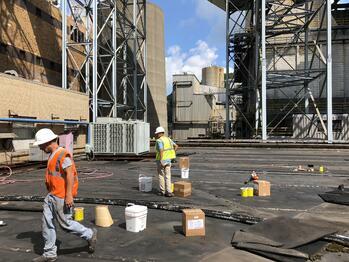 As many of you have probably seen from our job updates, many corporations have buildings with these two materials. If you notice any damage, knowing your material will help you decide what steps and materials will be needed to repair your roof. 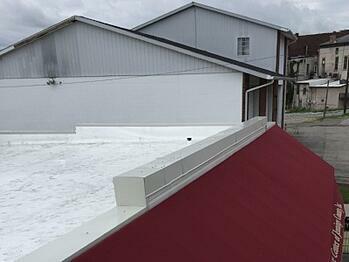 If you do not understand your flat roof, it would be best to contact a local roofing company to help you! 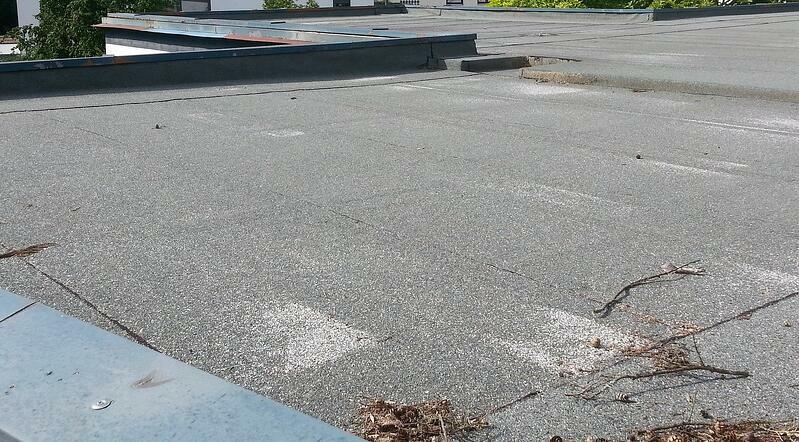 Any openings in your flat roof can lead to potential damage. 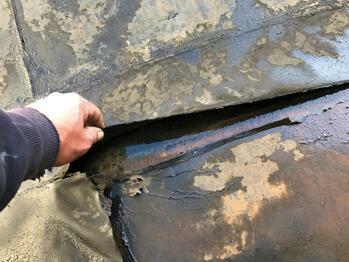 It doesn’t matter the size, any cut, big or small, it’s important to cover/seal it properly. 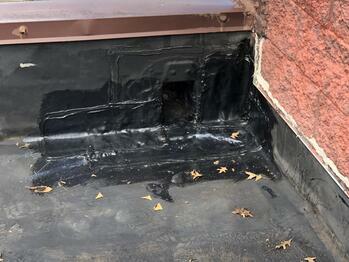 Even slight cuts or openings along parapet walls will lead to water damage. 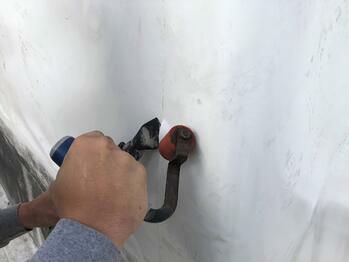 Loose membrane, while it will keep the rain out, can lead to pooling. If you see any of these signs, be sure to address them or call a local company to help! 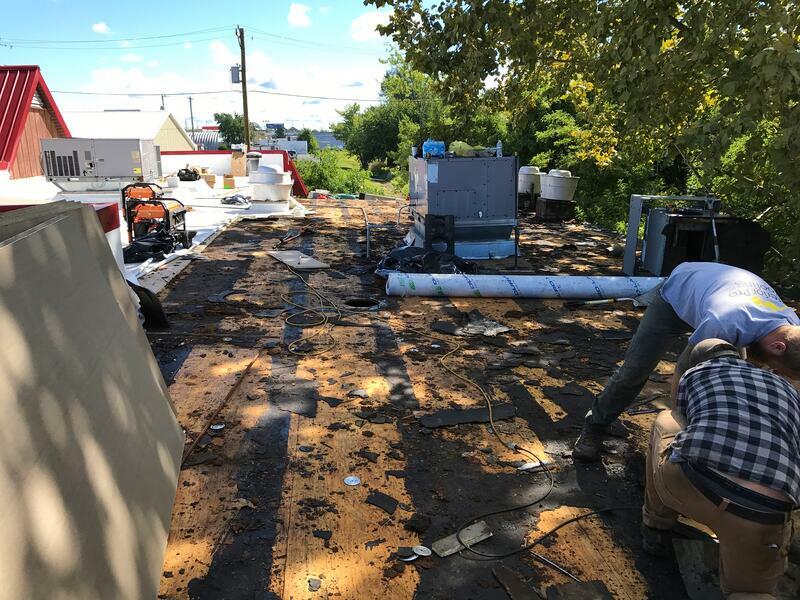 For you folks who may not have much roofing experience under your belt, we hope that this blog has provided some insight and knowledge regarding flat roofs and the warning signs that you should keep an eye out for. Or if anything, we hope this served as a friendly refresher course for you more experienced individuals. If you still want to know more, be sure to check out our Building Owners Guide to Flat Roofing below for more advice and tips!